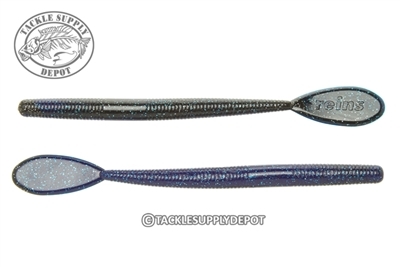 The paddle tail worm may not be a new concept but Reins has taken this provide bait and made some changes that make this worm stand out from others. This worm can be rigged multiple ways making it versatile and easy to adjust to the conditions at hand. When rigged as is the super thin paddle tail provides subtle action that drives fish crazy. Thanks to its tapered body the tail is able to catch more water thereby having an improved action. The tail can be cut several ways to match different styles of fishing ranging from a cut tail for a different action to a vibe style tail for when burning the worm across the surface. Cut a fork into the tail and use the worm like a soft jerkbait or cut the paddle off completely and use as a stick worm. This worm will reduce the amount of plastics carried on any given situation and allow an angler to fish all conditions faced.